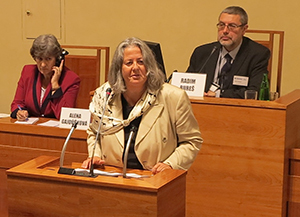 Alena Gajdůšková, First Vice-Chairperson of the Czech Senate, welcomes participants to the conference. Why are Nordic countries seen as having lower levels of public sector corruption than other European countries? What experiences do these countries have in fighting corruption, and what can weaker performing countries like the Czech Republic learn? It was questions like these that our recent conference “Corruption-free society: Perspectives from the North” set out to answer. Jointly organised by the Czech Senate, the embassies of the four participating Nordic countries (Denmark, Finland, Norway and Sweden), and Transparency International Czech Republic, the event brought together non-governmental experts, entrepreneurs and high-ranking political officials to exchange ideas in the shared struggle against corruption. The conference, which was the first of its kind, was based on the notion that corruption is perceived to be significantly higher in the Czech Republic compared to Nordic countries (see chart on right with Corruption Perceptions Index 2013 scores). According to the index, Czech Republic scores 48 on a scale where 0 is highly corrupt and 100 very clean. Additionally, the conference sought to tackle why the effects of corruption on Czech society seem to be much larger: when surveyed, the Czechs turn out to have the third lowest trust in public officials worldwide. The high scores of these northern European countries are no coincidence nor do they develop naturally. Through this conference and sharing experiences, we showed Czech lawmakers and the general public that Nordic countries struggle with corruption just like the Czech Republic does. Moreover, these countries’ achievements are a result of effective anti-corruption measures and thus such results are possible for the Czech Republic as well. Prevention of corruption has to be part of all national anti-corruption efforts alongside effective enforcement, as can be seen by the Swedish Anti-Corruption Unit, which, for example, has advocated for negligent financing of bribery to be made a criminal offence. Codes of conduct are key. In the private sector in particular, enterprises should be made responsible through codes of conduct that apply to themselves, as well as their supply chain and contractors. Regional and municipal governments are especially vulnerable to corruption, which has to be combated with an inclusive anti-corruption programme. Ethical and administrative standards are especially important in order to strengthen the integrity of public institutions. Annika Jagander, Swedish ambassador in Prague, shares about the Nordic experience. The Czech Republic has many problems to deal with – Alena Gajdůšková, First Vice-Chairperson of the Senate, pointed to the public’s low trust in the judiciary’s impartiality, and Jan Spáčil, Chair of the Board of Transparency International Czech Republic, flagged the low awareness of corruption in the private sector. There are certainly lessons to be learned from the Nordic experiences. But, as the Higher Public Prosecutor for Bohemia pointed out, no instrument or idea presented can simply be used as is – they must always be adjusted to the national and local context. In order to further dialogue about anti-corruption in the country, Transparency International Czech Republic has published the conference’s key findings, the presentations from the speakers and relevant data.